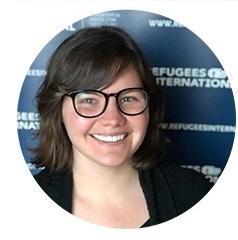 Katherine Seaton is Manager of Corporate Relations and Donor Communication at Refugees International. Previously, she worked at the peace building non-profit, Search for Common Ground, for both the U.S. programs and development departments. Katherine’s experience also includes positions at the World Food Program USA and the office of U.S. Senator Bernie Sanders. She earned a Bachelor’s degree in international studies from American University and a Master’s degree in international communication from Boston University.